From spring summer 2012 collection of Giuseppe Zanotti, here decolletes bicolor its finest! Among other things we talk about one of the models that recently have appeared often in photo shoots for fashion magazines over the feet of celebrity and if you even look at a picture you'll see why! Back to the model of decolletes very narrow point that this year more than ever are seeing very interesting revival in any collection of great brands. But of course, redesigned by Giuseppe Zanotti, could not remain a classic, no? Giuseppe Zanotti loves to amaze with his creations, even if you give a quick look at the models in the new summer collection will understand that the Italian designer shoe is truly a master of excess. This year in particular, his new collection is inspired by the symbolism of the 70s and this allowed him to play and experiment with shapes and color combinations very, very interesting! The decolletes you can see in the pictures, in comparison to other models are more "moderate", and yet have quite a temper! 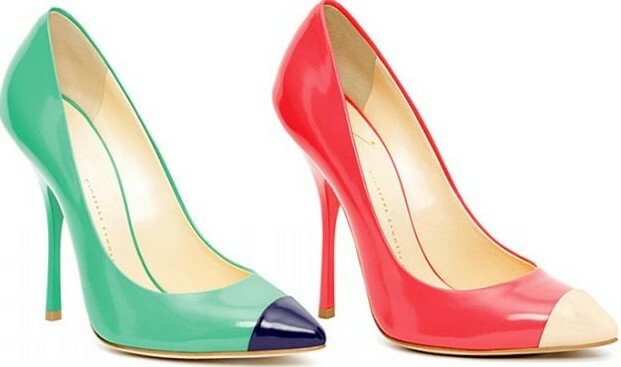 We speak of pointy pumps with stiletto heel Tall narrow 12.5 cm made ​​of leather with paint effect, a must this spring. 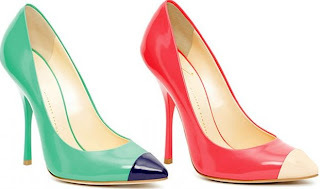 Of course, to catch the eye are the matching colored blocks of color choices, from the classic cream with its tip in contrasting red or alternatively the red for the upper and cream for the tip, the more extravagant models that provide color like green and dark blue, short, perfect shoes to complete look, or as colored blocks touch of color in a solid look! The price on the official website of Giuseppe Zanotti is 390 euros, what do you think?